But I made lists! And I have an action plan for next time. When we moved from our house to this rental property fifteen months ago, we cut our square footage in half. I gave away a lot of things but still had a lot of stuff I wanted to keep so we got a small storage unit. I could barely deal with everything on my plate back then (deep in grief, very sad about losing my children, very sad about losing life as I knew it). I just packed up all my baby stuff. I knew I would deal with it later. Last summer I cleaned out all of my paperwork and stuff from the fertility doctor. There was a lot of documentation! And you know what I ended up keeping? The pictures of my embryos. Everything else was shredded/recycled. I realized I didn't need any of it. But I only concluded this after going through every single piece of paper. It was an emotional day. Last fall I went to the storage unit and was able to get rid of more stuff. The more time I spent away from it, the easier it became to deal with and get rid of. Most notably, I gave my rocking horse that my grandpa made me to my cousin for her baby. A couple of months ago I texted an old friend from high school. I know he and his wife wanted kids but haven't had any yet. I asked him, "Are you saving a bunch of stuff for your kids? What do I do with all this stuff I saved for my kids??" He wrote back saying, yes, he had a bunch of Star Wars stuff that he was saving and he had recently started to wonder what he was going to do with it all. It seems this is a common thing among people who thought they were going to parent. And of course our kids probably wouldn't have been interested in our old stuff. I know that. But still. I miss that I won't get to share it with them. Plus, we had bought them a house. We bought a four-bedroom house for our kids. And we were filling it up. Not cluttered, we are kind of minimalists. But I still like to decorate a little. Some framed art and large vases. So now I have half a house in storage: tons of kids' stuff, lots of books (I miss them! my dream home has floor to ceiling bookshelves), and decorative items. And each time I go, it gets easier. There's so much to unpack here. I'll try to stay focused on my original point. I brought home my "Baby Stuff" box and I cleaned it out last night. It wasn't as hard as I thought it'd be. The good part was that unpacking the box didn't make me sad. It would've been fine if I had felt sad, but I'm glad that I didn't. I'm glad that some things that used to hurt or sting don't hurt or sting as much anymore. I went through the box and decided what to do with everything. I'm keeping all of my specialty onesies. Why? I don't know. But they don't take up much space and I still want them. But I'm giving away a nightlight my sister gave me, a cute burp rag my mom gave me, and a book that I bought to read while I was pregnant. And that was that. I finished my semester, I'm on vacation, and I am Out. Of. It. So tired, so exhausted, so thankful, so content, but so completely done. Happy to be on vacation. When I first mentioned this trip idea several months ago to my husband, all I thought was I'll be done with school, it's my only break in the program, and we need to take a trip together if possible! Since MD (my abbreviation for today's "holiday") isn't ever on my mind, I didn't even realize I'd be out of town for this day. Last year for MD, I remember that I didn't even leave the house. It was a conscious decision. I didn't feel terrible but I didn't feel comfortable, so I just enjoyed a day at home, reading on the couch and eating pizza. It was fine. Vacation is great and I really am cultivating a life that will work for me. It's not a complete solution. I still miss my kids. I thought coming on this vacation might make me glad I didn't have kids. They are expensive and tiring and a lot of work, haven't you heard? I am "so lucky" that I "get to travel," right? Well, it's both. It's an amazing trip, but it's not the salve that fertile people think it is. I am having fun though. And I completely forgot today was MD. And honestly, that was nice. I finished final exams. I can't believe I just did another semester. Going back to school wasn't even on my radar screen. I've already had a couple of different jobs/careers. I never thought I'd be back in graduate school learning about another one. I did finally say to my husband last night though that I think it's harder to go back to school when you're older. I've really been fighting that thought because I don't want it to be true. And there are a lot of aspects that are so much easier. When you're older you (hopefully) have less dumb drama in your life. You can manage time and demands and deadlines better. When you've been through any trauma like infertility, that can help keep the school stress in perspective. And often, you appreciate the opportunity to go back to school. I don't want to discourage anyone from going back to school. If you really want to learn the material and/or you really want to change careers, it is very, VERY much worth it. I have fallen in love with my new profession and I can't wait to start working. I can see myself doing this for the rest of my life, happily and contentedly. I don't remember being this tired in any of my other programs. Maybe it is this program. Maybe it is my age. Maybe, probably, it is a combination of those two things plus the fact that I started school while still processing the trauma of infertility. But I'm glad I didn't wait. If I waited to move or sell my house or start school when I actually felt ready, I might still be in that place. It took doing all of those things to help me move forward. So I don't want to discourage anyone from going back to school. Or moving and selling your house. Or doing anything else that seems the tiniest bit desirable but absolutely insurmountable. It is A LOT of work. 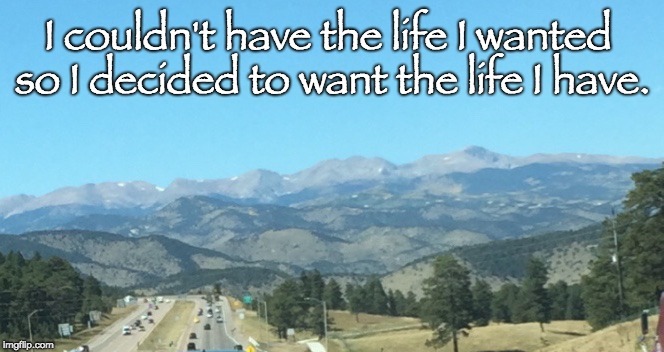 But, for me, it's better than sitting in the house I bought for my children wondering what I was going to do with the rest of my life. But it's different. It's not what I thought I would be doing. It's not what any of my family or friends are doing. It's not what the majority of my peers are doing. That's why I don't expect anyone to understand my life. My life is so different in so many ways. I can't be expected to explain myself to everyone who is wondering why I'm doing this but not doing that or why I'm going to this but not traveling for that or whatever it is people happen to be curious about in the moment. I know I make my decisions practically, compassionately, and with integrity. 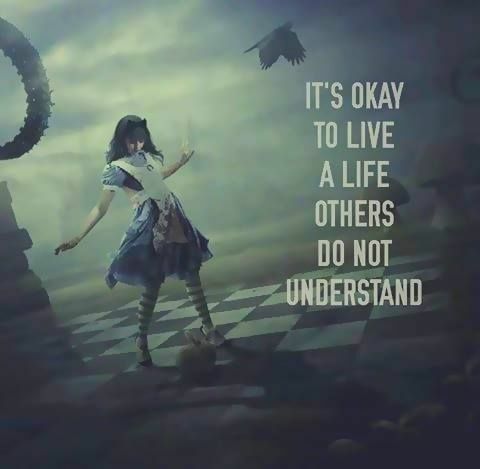 It's okay if others don't understand.